I, along with a group of mechanical and electrical engineers, decided to take a class project to the next level. We began this project for a Principles of Engineering course, which required us to create something with an electrical, mechanical and software component. 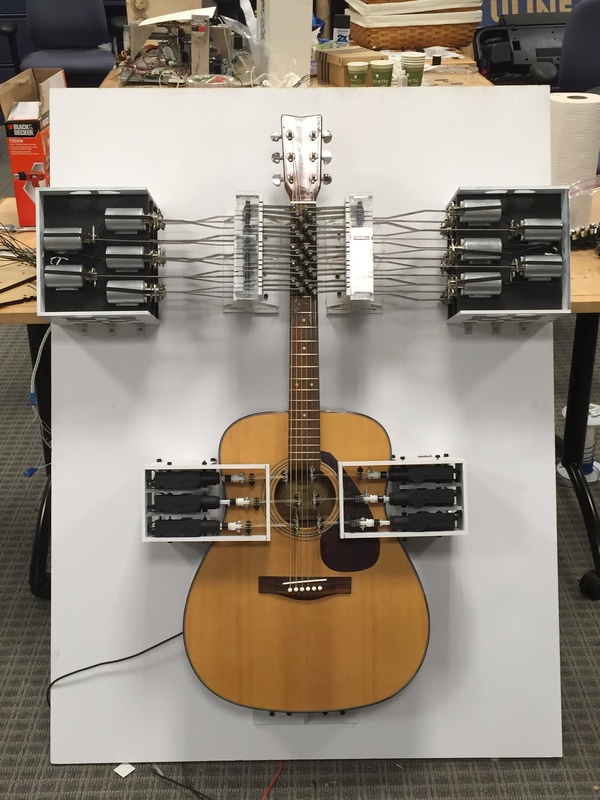 We decided to make a Robotic Player Guitar. I am the software lead on the team and in charge of the interface, backend and embedded system. Before even starting the project, our professor warned us that we were taking on a task much greater than the class required. He was even unsure that the task was feasible in the time period allotted. But, we were motivated by the potential of the product and decided to face the challenge. After a grueling eight weeks, the result impressed the student body and faculty. Because of this drive, we are still improving on it (two years later) for permanent display at Olin College. Our first iteration (for the class project) was driven by an Arduino Uno and controlled by a python backend. I wrote code to interpret Guitar Tablature, communicate across a serial port to an Arduino, convert it into a binary string and control the actuators and solinoids via SPI. The second iteration (first improvement after the class) ongoing takes MIDI files as inputs and uses an Arduino Due to provide more power. It uses a NodeJS Web App and is controlled by a RaspberryPi.